It is replaced by the Datamax-O'Neil E-4205e. 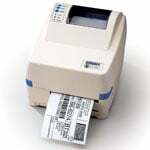 The E-4203 is a small, compact, thermal printer designed for a variety of label and tag printing applications. In either direct thermal or thermal transfer mode, this product is designed for low to medium volume printing. The finished E-4203 represents a significant achievement in printer design and engineering. It includes a totally new enclosure as well as enhanced electronics and firmware that, when combined, result in an outstanding entry-level product. As with all our Class products, the E-4203 was put through our innovative beta tests and has received extremely favorable comments as a result of that process. The E-4203 is designed from the ground up to be more price, feature, and value competitive than any other printer in its class. Our objective is to secure entry-level applications and opportunities previously unavailable to us because of lack of features or price. The E-4203 will also serve as a springboard to I-Class and W-Class opportunities within organizations unfamiliar with the new Datamax "Class" products. Standard features on the E-4203 include a unique direct thermal case top, 3 ips print speed and a three button, three LED control panel for maximum configuration flexibility and printer status indication. A see-through media window and two distinctive case top designs round out an impressive assembly of standard features. E-4203 options include a heavy-duty rotary cutter, peel and present sensor, and memory expansion. Memory expansion is made up of a 3MB flash module, which may be ordered blank or with CG Times (Western Language support) font set, Kanji Gothic B, or Simplified Chinese GB. The E-4203 can print a wide variety of labels ranging from small office shipping labels to compliance and general purpose product identification labels and tags. Medical and commercial laboratories, automobile service shops, walk-in shipping and mail centers, and inventory stock rooms are all typical examples of the types of users that can benefit from the E-4203 . And with PDF417 and MaxiCode two dimensional barcode capabilities, the E-4203 can print complex transportation symbols and label formats. Light weight and a small footprint, combined with the standard features, make the E-4203 a perfect choice for low to medium volume labeling needs. The new E-4203 sets a new price/performance standard for entry level, on-demand 4" label printers.